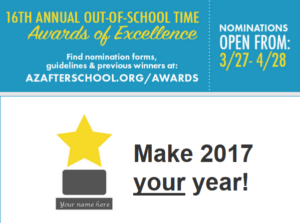 Nominate your program, colleague or leader for the Arizona Out-of-School Time Awards of Excellence! Boys & Girls Clubs of Metro Phoenix – Stewart Branch was honored as the 2016 Outstanding Out-of-School Time Program! Click here for a video of the 2016 Outstanding Program Finalists! Click on the picture to find out more information including rules and guidelines, nomination forms, and tips for writing a successful nomination.